Stevia is a sugar substitute that can be added to food in doses as large or small as desired. Individuals who use stevia regularly or in large quantities may notice common side effects such as headaches and nausea from this intense sweetener. If you’re cooking with a stevia sweetener for the first time, use it sparingly, keeping in mind that it is much sweeter than sugar and is best used in small amounts. Stevia side effects are more likely with a large quantity of this alternative sweetener. The myriad benefits of using stevia in place of sugar makes it tempting to pour the substitute sweetener into every dish that calls for a bit of sweetness. Research indicates that stevia is safe in doses of as much as 1500 mg daily for up to two years. If you find yourself experiencing these side effects, you may need to reduce or cease your use of the product to get relief. These side effects tend to be mild and typically last only a short while after consumption. While lower blood pressure and blood sugar can actually be beneficial for some, those who struggle with controlling their blood sugar, or who already have low blood pressure should be mindful of their use of stevia sweetener. More serious side effects of stevia have been indicated for some individuals. It is important to be aware of these potential side effects before adding this artificial sweetener to your diet. Parents should be especially careful, as some side effects include fatigue, weakness and altered metabolism in children. 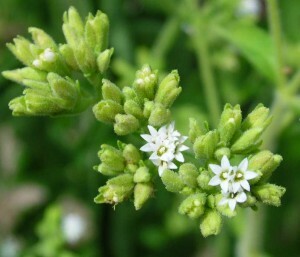 Some studies have indicated that stevia may be effective for birth control. Though this isn’t conclusive, it does indicate that stevia should not be used by individuals who are pregnant, breastfeeding or planning to become pregnant. Over time, side effects may include decreased fertility in both men and women. Studies performed on rodents indicated a reduction in the sperm cells produced, though this has not been recorded in humans. The topic of cancer as one of the stevia's side effects is hotly contested. In animals, high doses of stevia have been reportedly connected to cancer. However, this information came under serious fire upon release. Further studies will need to be conducted to provide conclusive information on this topic. Stevia belongs to the Asteraceae/Compositae family. This is the same plant family that contains such plants as marigolds, chrysanthemums and – most notably – ragweed. Individuals who are allergic to ragweed or any other plants in this family should avoid stevia products as they may cause an allergic reaction. Swelling, hives, rash and difficulty breathing are all signs of an allergic reaction and should be reported to a doctor immediately. If you are taking certain medications, you may experience additional side effects. Any medication containing lithium has the potential to interact with stevia. The stevia sweetener can act as a diuretic, reducing the amount of lithium the body can hold. If you are taking lithium and wish to use stevia in your diet, consult your health care provider to discuss changing your lithium dosage. If you are on a medication for high blood pressure such as diltiazem, captopril, furosemide, lisinopril, enalapril or any other blood pressure medication, discuss the potential side effects with your doctor before adding it to your diet. Stevia could cause your blood pressure to drop dangerously low. It is generally recommended that patients on high blood pressure medication avoid the use of stevia. As mentioned previously, stevia is commonly used by diabetics who want a sweetener that won’t cause their blood sugar to rise. Stevia can actually lower blood sugar levels. For this reason, diabetics who are already on medication, such as insulin, for their diabetes should be careful with stevia sweeteners. Discuss the product with your doctor to determine the best way to adjust the dosage of your medication in response to these stevia side effects. As a substitute for sugar, stevia can be very effective. Even small doses of this sweetener will have a big impact on the taste of your food. If you struggle with weight loss or diabetes management because you can’t give up sweet dishes in your diet, stevia could be a useful option. However, users of stevia products should be mindful of the potential side effects and consult a doctor about their diet if they experience any kind of discomfort after using the sweetener.